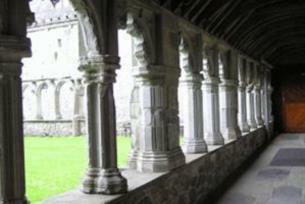 Holycross Abbey is a restored Cistercian abbey built on the River Suir in Co Tipperary. 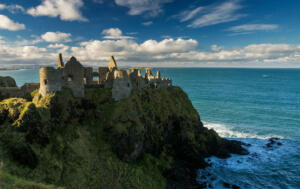 Founded in 1168 by the King of Munster, it became a place of great medieval pilgrimage; Catholic Mass and other religious events continue to be celebrated there. Holycross Abbey near Thurles, Co Tipperary, is one of Ireland’s National Monuments and has a rich and colourful past. It takes its name from a relic of the True Cross or Holy Rood, a fragment of which was brought to Ireland by Queen Isabella of Angoulême around 1233. Left in ruins after the 15th century, the Cistercian abbey was lovingly restored in the 1970s by Archbishop of Cashel Dr Thomas Morris, who opened its doors once again to thousands of pilgrims and visitors from all over the world. Today it is a peaceful landmark, the perfect spot for quiet contemplation and historical discovery. The elaborate groined roof of the interior creates a calm sense of space, while the relic of the True Cross can be viewed in a quiet enclosure. In 1168, King of Munster Donal Mór O’Brien founded the monastery for the Benedictine Order, but later transferred it to the Cistercians and it was inhabited by monks from Monasteranenagh in Co Limerick. The newly developed Padre Pio meditation garden on the west bank of the River Suir holds a special day of pilgrimage in May every year, while the nearby village of Holycross has much to offer for visitors. Its attractive cluster of thatched cottages were built in the early 1970s as part of a regional Rent and Irish Cottage scheme. Game anglers are accommodated upstream and downstream with day permits available, while the local community remains active in caring for the many flowers, shrubs and trees that adorn this historic site. Visitors to Holy Cross Abbey in Tipperary will depart refreshed, and instilled with a sense of the immense history of this sacred place—a destination of pilgrimage for people all over world.